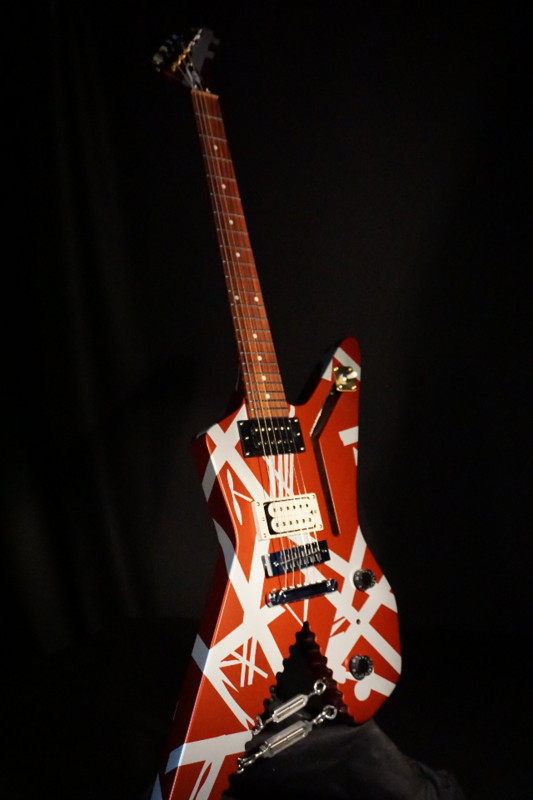 Eddie Van Halen is known for infusing his iconic guitars with their own identity. 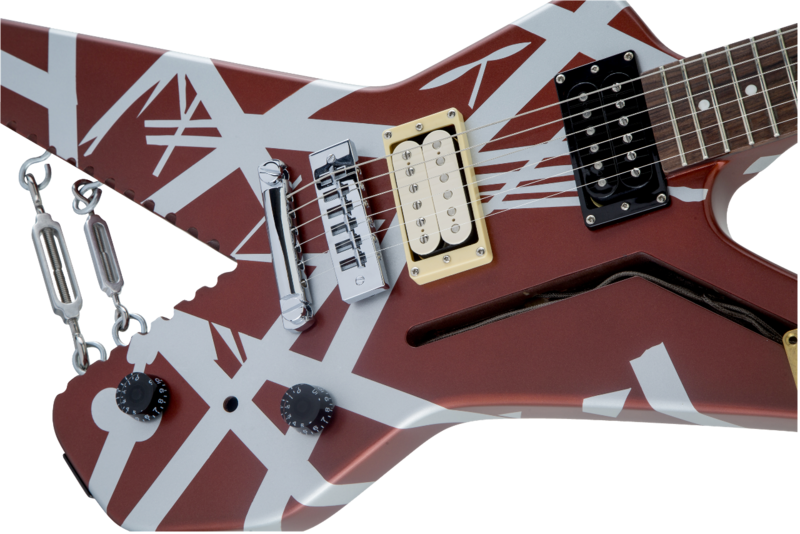 With his visionary hands-on approach to personally modifying his style and tone, Eddie has created some of the most memorable guitars in rock ‘n’ roll history. 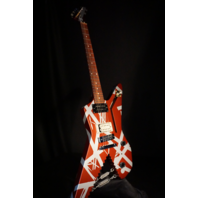 One of those guitars became as iconic to Van Halen’s sound as tapping was to Eddie’s playing. Aptly named the “Shark,” Eddie took his angular offset axe and sawed a chunk out of the body, leaving jagged edges in the wood that resembled teeth. After applying a coat of silver paint, Eddie added tape in his famed striped pattern and then grabbed a rattle can of burgundy Schwinn bicycle paint to finish the job. 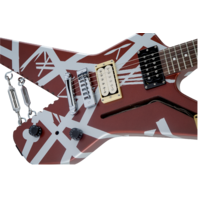 The final striped creation was initially seen live during the first Van Halen World Tour in 1978, but became more widely known and adored by fans after appearing on the back cover of Van Halen’s 1980 album, Women and Children First. 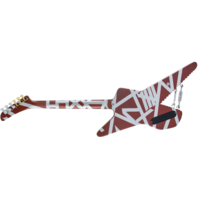 After years of receiving requests for this famed instrument, EVH® is proud to release the new Striped Series Shark model. This high-performance axe features an angular ash body that is paired with a rock-solid set maple neck, carved to a comfortable modified “C” profile. 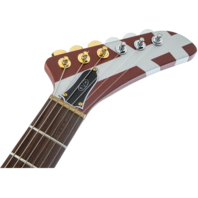 The neck also features a “hockey stick” headstock and the same striped paint job on the back, while the fast-playing 12”-16” compound radius Pau Ferro fingerboard has 22 jumbo frets and white dot inlays. The Shark is also fitted with custom designed EVH Wolfgang® alnico 2 Humbucker bridge and neck pickups, delivering the ideal amount of power and articulation with sweet sustain and thick chunky rhythms in a perfectly balanced EQ curve. Adding to the unique style of this instrument, the bridge pickup features parchment bobbins with metal braid wire, while the neck pickup features black bobbins with metal braid wire. 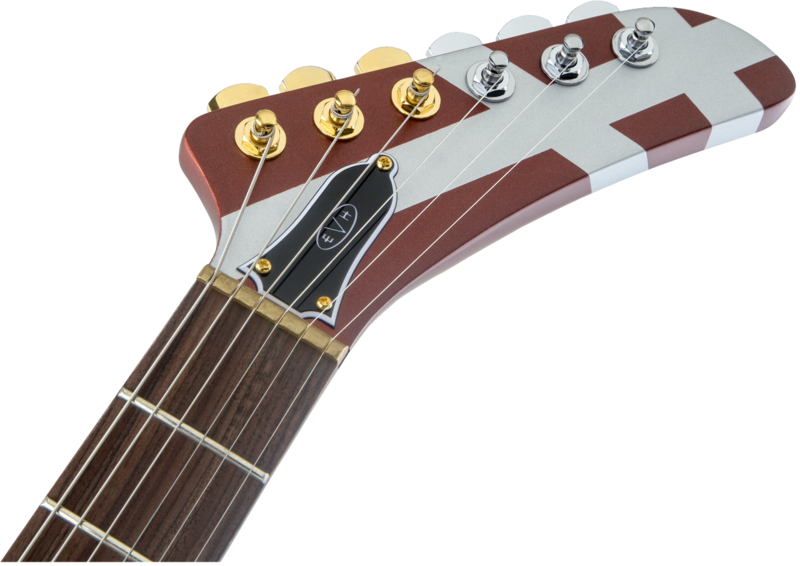 A low-friction volume knob with treble bleed provides for unmatched performance and even-volume tapering for the smoothest volume swells, while a chrome-plated solid-brass harmonica bridge provides massive attack, presence and sustain. 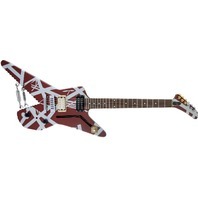 In addition to its instantly recognizable Burgundy with Silver Stripes paint job, the Shark boasts other eye-catching features including black numbered speed knobs, three-way toggle switch housed on a brass mounting plate, brass nut, gold and chrome custom EVH-stamped Gotoh® tuners and chrome eye hooks with turnbuckles.